Super Bowl time traditionally means a celebration of all things battered, breaded and fried. This year, we're putting some Paleo twists on your go-to party staples that will leave all your guests cheering. For your primal party, try some of these simple and satisfying Paleo Super Bowl snacks. Check out our Paleo menu on PlateJoy for more snacktime inspiration! Preheat oven to 450 degrees F and spray a baking sheet with cooking spray. Cut a 1-lb cauliflower head into bite-size florets and place in a bowl. Melt 1 tbsp clarified butter in the microwave, then mix in 2 tsp garlic powder and 3 tbsp hot sauce. Pour over cauliflower and toss until coated. Spread on prepared pan and bake 15 minutes, stirring in between, until browned and softened. Preheat oven to 375 degrees and line a baking sheet with foil. In a small bowl, mix together 1/4 cup almond flour, 1/4 cup nutritional yeast, and a generous pinch of salt and pepper. In another small bowl, lightly beat 2 eggs. Cut 2 zucchini lengthwise into quarters, then cut each quarter into 4-inch lengths. Dip each into the egg mixture, then coat in the flour mixture. Place on prepared baking sheet and bake 15 minutes, flipping once in between, until golden. 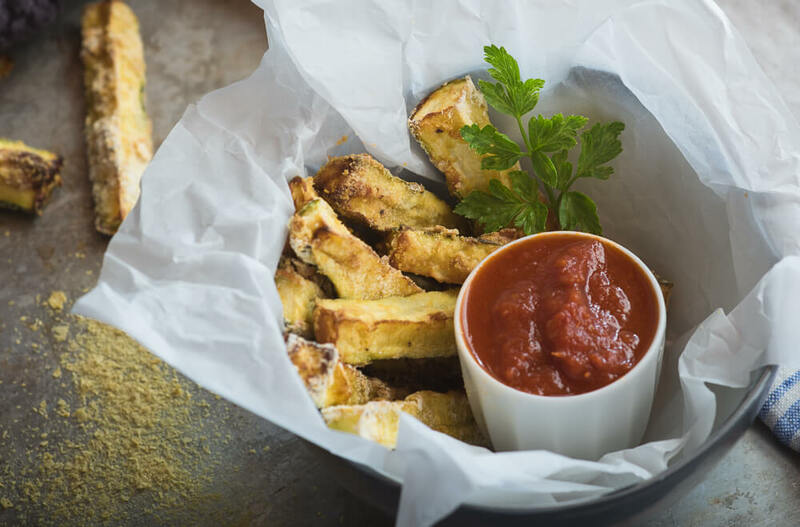 Enjoy with your favorite marinara sauce for dipping. Peel 1 cucumber and pat with a paper towel. Add to a food processor, along with the flesh of 1 avocado, 2 tbsp fresh mint and 2 tbsp fresh dill. Add 2 tbsp lemon juice and process until smooth. Season with salt and pepper to taste. Enjoy with baby carrots or celery sticks.